You too can have gluten-free, grain-free poppyseed bagels if you purchase Paleo Cooking from Elana’s Pantry. 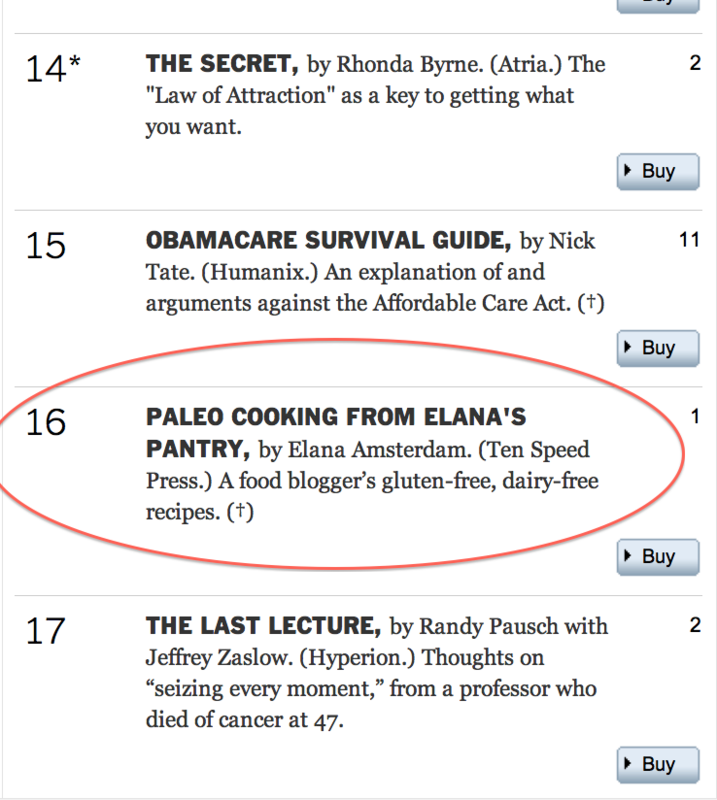 Did you know that Paleo Cooking from Elana’s Pantry is a New York Times Bestseller? With nearly 100 recipes for everything from classic Paleo staples such as Flank Steak and Cauliflower Rice to indulgences such as Blueberry Coffee Cake and Mojito Mocktails, there is something for everyone in this book. A couple of weeks ago I had the pleasure of discussing Paleo Cooking from Elana’s Pantry on Colorado Public Radio with host Ryan Warner. The interview is now being broadcast by various NPR stations across the country. Meanwhile, the written reviews of Paleo Cooking from Elana’s Pantry continue to roll in. Here’s what people are saying! If you’ve enjoyed Paleo Cooking from Elana’s Pantry, please head over to amazon.com and leave a review. The book is still new and there aren’t a ton of reviews, so your input and thoughts are greatly appreciated. My New York Times Bestseller is available on amazon.com and barnes & noble.com You can purchase your own copy of the book today! I’m 55 and have started to really pay attention to what I eat. I’m looking forward to getting your book and trying some of the recipes. I always trust your delicious yet very simple recipes. I hope and believe that this book is as good as your other cookbooks. I work at our local public library and the day this cookbook came in, I snatched it up and have since purchased it even though I can check the book out for free whenever I want. Because I have access to just about every Paleo cookbook out there, and believe me, I’ve done the research, I keep coming back to Elana’s book every single time! I don’t enjoy spending enormous amounts of time making tedious, time consuming dishes that call for tons of ingredients, which can really add up in cost, the recipes are simple to make and very delicious! I thought it would be impossible to get our 11 year old off processed foods but this cookbook is doing it! I couldn’t be happier, well, yes I could, more recipes please Elana…. Is there an ebook version? You should really consider releasing one! I just left a very positive comment on Amazon for your Paleo Cooking book. I am so thankful for your books and blog, leaving a glowing “comment” was the least I could do to thank you! I had pre-ordered a copy of your book prior to its publication and distribution. With whom should I get in contact about this matter? I am a big fan of your recipes and looking forward to getting your book. Many thanks! The CPR interview was such a pleasure to listen to. You represented cheerfully those of us who eat “differently” than the “SAD” – standard American diet. Thanks for posting it. Thanks for all you do – it is appreciated in my kitchen and so many others. – Congrats on the NYT Best Seller List!!!!!! Pad Thai – I see it now in the Amazon.com index to the new Elana’s Paleo Cooking book – not sure which version of that recipe is in that book, but since you mentioned the butternut squash version in radio interview, that’s probably where it can be found, in the book, not on this site. Elana… I don’t have the book yet… I will be asking for it as a gift… Just wanted to let you know how grateful I am for your talents! I have your other cookbooks and they are used to death! I am so thrilled that your latest book is a huge success! You deserve it!